In my first job we used Emacs as our main text editor. However, I have no idea how to use it properly so I just used it more like Notepad++ than Emacs. In our team there is one person who refused to use Emacs, instead he was using vi (without the m!). To be honest, it looked painful watching him edit code with no syntax highlighting, no line numbers, and no plugins whatsoever. We tried constantly to convince him to use Emacs but he always refused and stuck to using vi. I thought the guy was crazy. Fast forward 12 years in my career. I was attending a Ruby conference with my peers and one of the speakers (Brad Urani) demonstrated zshell, vim, and tmux and how he does development in his machine. It looked cool! Some of my peers also uses vim and tmux so its not a new concept to me, however I always decided to use gedit all these years. This time, they probably thought I was crazy. After the conference I finally decided to jump to the other side. I will no longer use any text editor or IDE for programming and will force myself to use vim exclusively. 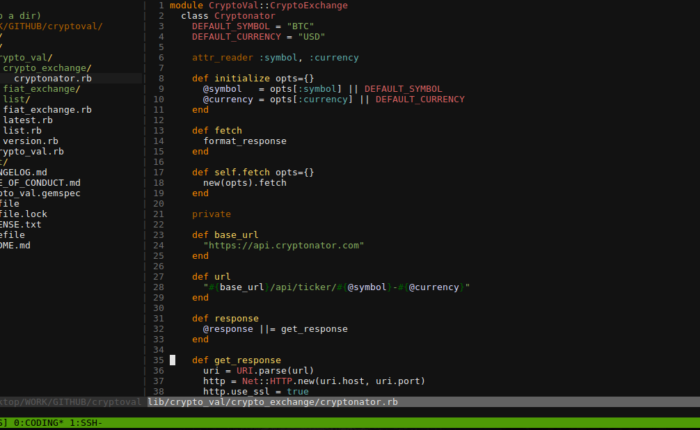 I also decided to use tmux instead of relying on the guake terminal for more awesomeness. After two months, am I very pleased with the results: I now have my development environment set up using zshell, vim, and tmux and all the tools that I used to have before have been configured to work on vim. As I feel like I am years (maybe decades) late to the party, here is a simple guide I wrote to help people like me who want to dive head-first into vim and tmux. This step is not really required to use Vim and Tmux, but it is recommended due to several improvements and plugins that you can use to improve your development environment. Once zshell has been installed, we will want to make it our default shell (instead of let’s say bash). This will make your system use zshell when you invoke the terminal or the command line.